There are 17 Assisted Living Facilities in the Greenville area, with 2 in Greenville and 15 nearby. To help you with your search, browse the 84 reviews below for assisted living facilities in Greenville. On average, consumers rate assisted living in Greenville 4.3 out of 5 stars. Better rated regions include Smithfield with an average rating of 4.4 out of 5 stars. Greenville, Rhode Island has an unusual history. Located in Providence County within the city of Smithfield, this former colonial village was founded in 1730. Seniors who retire in Greenville can explore its rich history in local museums. Providence County offers seven Assisted Living Facilities (ALFs), and 47 additional ALFs can be found in the surrounding area. In Rhode Island, ALFs are also called Assisted Living Residences, and exist to house and care for seniors. These facilities are regulated by the Rhode Island Department of Health and may assist seniors with daily activities such as bathing, dressing and managing medication. Greenville’s climate is varied, with an average July high temperature of 82 degrees, and an average January low temperature of 18 degrees. Due to the chilly winters, when Greenville gets an average of 39 inches of snow, seniors with limited mobility may have difficulty staying active year-round. Seniors can feel safe in Greenville, due to its low crime rate. Violent crime is rated at 30.2 out of 100 (1 being the safest), just below the national average of 31.1. Property crime is rated at 29.3, which is lower than the national average of 38.1. Greenville has no facilities from which to choose in the event of a medical emergency or illness, with the nearest major hospital, Rhode Island Hospital, located in Providence. Seniors seeking transportation to doctor’s appointments, shopping and local attractions can use the Rhode Island Public Transit Authority (RIPTA). RIPTA's buses are wheelchair-accessible, so individuals with limited mobility can ride them with ease. Providence County’s air quality may prove difficult for seniors with respiratory illnesses, due to Greenville's ozone score, which the American Lung Association has rated a "D". However, Greenville's particle pollution 24-hour rating is better, scoring a "B", which may give relief to seniors with mild respiratory issues. History buffs will enjoy Greenville's Smith-Appleby House, a historical home built in 1696. Seniors can also visit the Rhode Island Historical Society's Museum of Work and Culture, which features exhibits about the lives of Rhode Island textile workers during the 19th and 20th centuries. Assisted Living costs in Greenville start around $0 per month on average, while the nationwide average cost of assisted living is $4,000 per month, according to the latest figures from Genworth’s Cost of Care Survey. 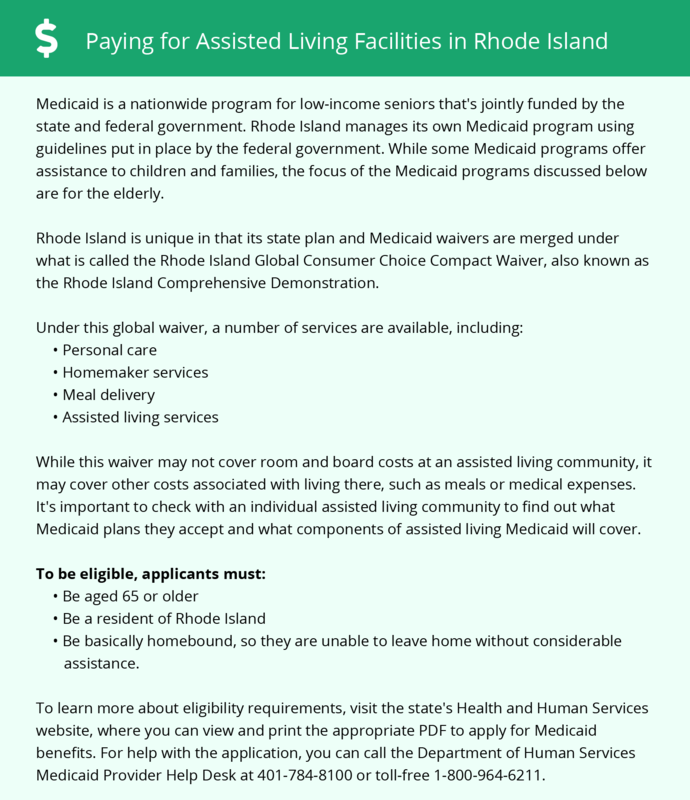 Low-income seniors in Rhode Island may be able to receive help for assisted living costs through the Rhode Island Global Consumer Choice Compact Waiver, which combines Medicaid with Rhode Island’s three previous waiver programs. In addition, the state offers an Supplemental Security Income (SSI) Assisted Living Program for seniors who are SSI-eligible. To see a list of free assisted living resources in Greenville, please visit our Assisted Living in Rhode Island page. Greenville-area assisted living communities must adhere to the comprehensive set of state laws and regulations that all assisted living communities in Rhode Island are required to follow. Visit our Assisted Living in Rhode Island page for more information about these laws.